Kalpesh H Shah, Suman P Singh, Jignesh Rathod. Background: A surgical site infection (SSI) is an unintended and oftentimes preventable consequence of surgery. SSIs are associated with patient morbidity and increased healthcare costs. SSIs are commonest nosocomial infections after urinary tract infections (UTI). 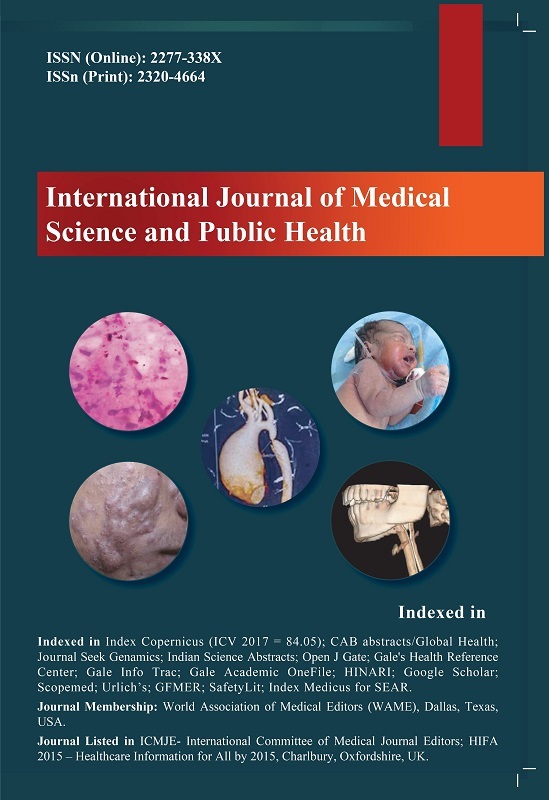 Objective: The present study was aimed at obtaining the incidence and bacteriological profiles of SSI and determining various risks factors influencing the SSI rate at tertiary care hospital, Gujarat, Western India. Materials and Methods: All patients who underwent various surgeries in Shree Krishna hospital from July 2013 to May 2014 were included with approval from Human Research Ethics Committees. Details of the surgery and patient profile along with various risk factors were collected in predesigned proforma. If there was infection then the suspected samples were obtained from wounds and processed without delay using standard microbiological methods. Infection rates and risk factors were calculated using SPSS13. Result: During the study period 1181 surgeries were conducted. Overall SSI rate was 3.38%. The most common organism isolated was Escherichia coli (34.8%). Increasing age, diabetes mellitus, prolonged preoperative hospital stay, and ASA score >3, emergency surgery, prolonged duration of surgery (more than 75th percentile of NNIS duration cut point) and contaminated and dirty surgical sites were found to be associated with higher rate of SSI. Conclusion: Continuous surveillance of surgical site infections and study of factors that might increase the risk is important to reduce SSI rates if communicated to surgeons on time.